Robert Lalonde, regular contributor to the Canadian office of Aid to the Church in Need, is currently travelling in Africa. Before heading to Burkina Faso and then to the Ivory Coast, he spent Christmas and New Year’s in Senegal. 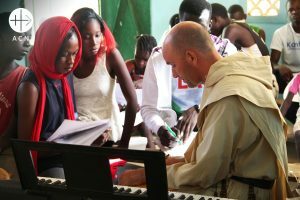 This is the first of a series of three texts about the people who make up the local Catholic Churches in these West African countries. Note that all quotes about the Christmas holiday are from Pope Francis, taken and translated from the book L’esprit de Noël, éditions Michel Lafon, 2016. On the night of December 22, 2018, Jean-Baptiste, a friend I met at the Institut de formation humaine intégrale de Montréal – a regular partner of Aid to the Church in Need (ACN) – welcomed me at the Dakar airport, in the capital of Senegal. Over the next few days, this Brother from the Discalced Carmelite congregation passed down so much knowledge on his adopted country to me that one would think he is actually Senegalese. But, above all, he revealed to me the love he feels for his people whose hospitality is only matched by their kindness. I feel this profound love when he celebrates the morning mass on Christmas Eve. That morning, in the Carmelite chapel of Kaolack, I hear the song of the stone curlews through the barred wrought iron windows. It’s as if these Senegalese birds are approaching to accompany Brother Marie-Pierre caressing his kora. This instrument, a cross between a harp and a guitar, invites God to penetrate our soul. Then comes the moment to sing Il est né le divin enfant. 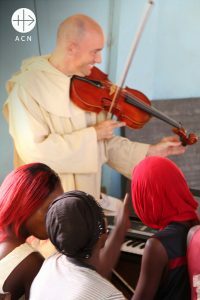 My singing is out of tune, but my heart, filled with joy, joins the voices of the monks to worship God. We are one, we are together in His name. The crucifix on the wall behind the altar reigns over the kingdom of the monks. The crèche is kneeling in front of the altar. Despite the absence of Jesus in this nativity scene, we doubt neither his presence nor his coming. Jean-Baptiste’s homily, recited softly, is proof. After having been invited to go in the peace of Christ, we exit, ready to face life’s torments. 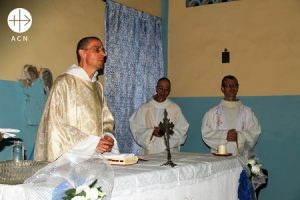 Right away, I accompany Jean-Baptiste in his mission, that of preparing a choir of some twenty Serer* young adults for the evening mass. 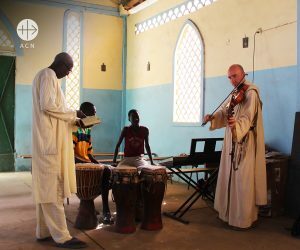 Once the keyboard, violin and guitar are in the trunk of the car, we cross the scrubland to head to the parish of Ndiaffate, where we will join the choristers. Once there, and despite the disorientation, I feel at home. I am surrounded by the humanity and solidarity of the people. The harmony of the voices impresses me, the amount of energy overpowers me. The rhythm is so lively that I seem to see the garlands dance on the ceiling and the lights on the tree following the beat by shining above a motley crèche. Lighthearted, I watch the master craftsman, wearing his most beautiful smile. Jean-Baptiste loves music. For him, it is an occasion to glorify God. “Singing is praying twice”, as St. Augustin says. On the way back, no motor vehicle. At times we see carts pulled by donkeys or horses, at other times we see herds of cows or goats, guided by Fulani people going in the same direction as us. It’s as if they will all be setting up camp in the Carmelite crèche. All of a sudden, I feel as though I am back in the time of Jesus. Momentarily feeling like an apostle delights me. Jean-Baptiste frequently stops on the side of the road to greet passersby. He says “Salamalakoum”, they answer “Malakoumsalam”. Muslims, Christians, it doesn’t matter. In Senegal, everyone exists side by side, without hostility. A Muslim man even invited Jean-Baptiste for the next day. Jean-Baptiste declines, not without an explanation, and proposes to postpone the invitation. This simplicity and warmth fill my heart with hope. At supper, silence is in order. I am integrating the day’s experiences and feel the peace reigning and the joy flourishing in me. The four Brothers surrounding me look radiant. One of them, Marie-Pierre, who will be presiding over the evening mass, seems to be preparing his homily. I have no doubt when I see him embodying it in such a dynamic and inspiring way when the moment comes to deliver it to the 200 faithful in attendance. Once the church is full, Jean-Baptiste gives the choristers the signal as the celebrant enters, accompanied by two other Brothers. From the first notes, my heart is touched by the presence of the Holy Spirit. All these liturgical songs contain a comforting je-ne-sais-quoi. As if the invisible momentarily captured all the weight of the world. It was this way throughout the Eucharist. I leave in the peace of Christ, ready to welcome him again tomorrow in the crèche. *West African people. In number, they make up the third largest ethnic group of Senegal, after the Wolof and Fulani people.